A directive to cut up to $100 million in spending at the Tribune Co. newspapers is but the latest challenge to a group of iconic titles that have been twisting in the wind for seven of the most tumultuous years ever experienced by the publishing industry. The budget cuts in store for the Chicago Tribune, the Los Angeles Times and six other dailies published by the company add to the uncertainty, anxiety and indecision that have distracted staffers at the publications since a series of convulsive – and inconclusive – changes in ownership and management commenced way back in 2006. Sadly, as discussed in a moment, there is still no end in sight. The timing of the ongoing cluster-kerfuffle could not be worse, because the managers and employees of the newspapers ought to be spending their days developing new products, acquiring new audiences and building new revenue streams to meet the abundant challenges of the digital era. The seven-year ordeal for the Tribune newspapers began in September, 2006, when the publicly held company kicked off the process of putting itself up for sale as shareholders feuded over its ebbing stock price. The yearlong hunt for a buyer ended when real estate mogul Sam Zell acquired the company in December, 2007, with $13 billion in debt and only $315 million of his own $4 billion fortune. Zell promptly put the company into a novel, privately held employee stock ownership plan that eventually resulted in a $32 million payout to employees whose retirement funds had been caught up in the scheme. Along the way, he memorably scolded the journalists at the Washington bureau of the Los Angeles Times for not producing any revenue. Zell’s effective control of Tribune lasted but 12 months, as the ill-conceived, over-leveraged and poorly executed acquisition drove the business into an epic, four-year bankruptcy. In addition to generating more than half a billion dollars in legal and other fees, the bankruptcy resulted in a never-ending series of expense cuts and layoffs. As soon as the company exited bankruptcy at the start of this year, its new chief executive, broadcaster Peter Liguori, immediately put the newspaper division up for sale. When the hunt for a buyer failed, Liguori decided in July to sever the struggling publishing assets from the more lucrative television businesses operated by the Chicago-based company (as explored further here and here). In the latest twist, Liguori last month ordered a fresh round of spending cuts to bolster the profits of the newspapers for a spinoff that remains an untold number of months in the future. Chicago media expert Robert Feder reported that Liguori wants $100 million in annual savings from the newspapers to commence by Dec. 1. Following Feder’s scoop, the Chicago Tribune said the target is $75 million to $100 million. The tribulations at the Tribune Co. in the last seven years could not have come at a worse time. The period happened to be the unkindest in history for American newspapers, with industry-wide advertising sales – the primary revenue stream – tumbling from a record $49.4 billion in 2005 to $22.3 billion in 2012. Suffering to roughly the same extent as its peers, Tribune’s publishing revenues dived from $4.1 billion in 2006 to $2.0 billion in 2012, according to the company’s financial statements. In fairness, it must be noted that approximately $400 million of the revenue decline can be attributed to the sale of Newsday to Cablevision in mid-2008 in a complicated transaction that subsequently saddled Tribune Co. with tax issues that could cost it some $273 million in back levies and penalties. In the second quarter of this year, Tribune’s publishing revenues fell 4% to $470 million from the level achieved in the same period in 2012. While Tribune has provided only fragmentary financial results for the newspaper division since its exit from bankruptcy, the company reported that the division in the second quarter of this year produced $75 million in earnings before interest, taxes, depreciation and amortization (EBITDA) vs. $45 million in the prior year. Assuming the newspaper division replicated the second-quarter results for each quarter of this year, then it would deliver nearly $1.9 billion in revenues and $300 million in profits over the full 12 months. At that rate, its EBITDA of nearly 16% would surpass the 13% average produced by the other publicly held newspaper companies. Even though Tribune Co. appears to be doing as well – if not somewhat better – than most other newspaper publishers, Liguori is calling for tens of millions of additional expense reductions to plump the bottom line. To put the full $100 million target in perspective, the sum is estimated by informed sources to be roughly equal to the combined newsroom budgets of the Chicago Tribune and Los Angeles Times. 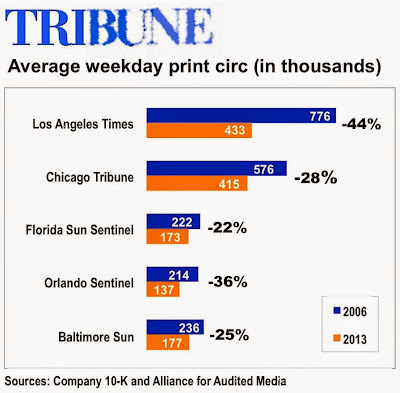 Where will Tribune’s publishers find up to $100 million in additional savings? To shrink spending over the years, the Tribune Co., like most publishers, has cut page sizes, news hole, marketing and headcount. As but one benchmark, informed sources estimate that the news staff of the Los Angeles Times numbers about 570 (this is corrected from an earlier undercount) today vs. a peak of 1,300 in 2000. Although payrolls already have been pared from historic levels, staffing is bound to come under further scrutiny, because so many other savings already have been implemented through outsourcing, production consolidation, administrative streamlining and similar one-time measures. While the Tribune does not report the current number of employees in the newspaper division, it did tell shareholders in 2006 that it had a total of 21,000 employees across all units with 17,800 individuals in the publishing division. Today, the company has 11,500 employees across all divisions, according to its public declarations. Assuming the staff cuts over the years were made proportionally by division, then the newspapers at this time collectively would employ approximately 9,500 individuals. This estimate probably is high, because it doesn't take into account the hundreds of employees who left the company when Newsday was sold. The Tribune spokesman did not respond to a request for the current news headcount. With more cuts potentially in the offing, employees accustomed to years of anxiety are likely to face more sleepless nights. Beyond the inestimable emotional, financial and sometimes physical strains imposed on employees by the long-running uncertainty at the company, you can’t help wondering how much the value of the publishing division itself has been weakened. 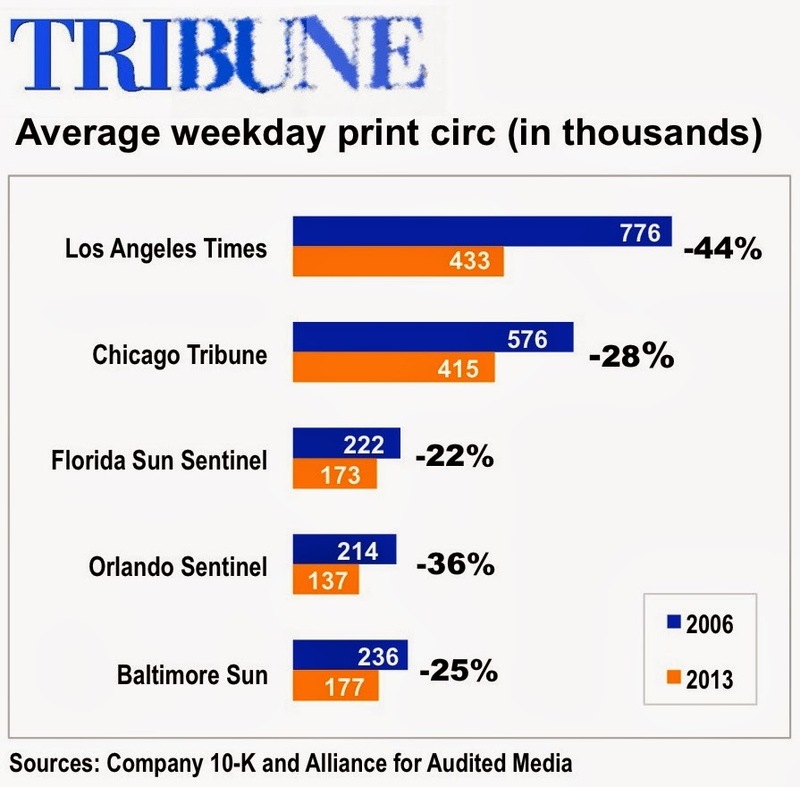 As illustrated in the table below, the average weekday print circulation of the five largest Tribune dailies has dropped by 34% since 2006. The Los Angeles Times, whose print readership has declined 44% since 2006, experienced the biggest drop of the group. In fairness, it must be noted that the circulation slide mirrors an industry-wide trend. But the deep readership and revenue declines suffered by newspapers in the last few years underscore the need for publishers to focus on pivoting as fast as possible away from the waning print model. By all outward appearances, the continuing corporate convulsions at Tribune have made the necessary focus impossible to achieve. Lacking day-to-day stability, clear-cut strategic goals, consistent management and steadfast ownership, some of the nation’s largest and most important newspapers have cycled fruitlessly, and sometimes aimlessly, as a host of digital competitors have sapped their audiences, their revenues and the power of their once-formidable brands. This is a not only tragedy for the employees and the communities they serve. It’s likely to be a tragedy for Tribune’s investors, too. I have always been curious about what happened to the employees' retirement accounts? Did their pensions get tied into the Sam Zell takeover? Did employees end up losing their pensions? Did their retirement accounts get gutted? Did employees get to vote on whether their money would be used this way? It's amazing how far the LA Times has fallen. Circulation used to be over 1,000,000 on weekdays. Now it's less than half that. The daily paper has become a pamphlet, maybe 50 pages if it's a newsy day. The Sunday paper is now as thick as the daily newspaper used to be. I still subscribe, but I don't know why. I barely look at the LA Times today, mainly focusing on the New York Times instead. And to think there are further cuts that are going to be made is disheartening. In the LA Times neighborhood, The OC Register seems to be doubling down and investing in print, expanding the paper and adding sections. It's still too much of a cartoonish (large fonts, lots of graphics) for my taste, but it may be worth another look if the LA Times continues on the trend it's going. Zell was one of the worst things to happen to the LA Times, second only to being sold by The Chandler family to the Tribune Company. Otis Chandler must be rolling in his grave. From "we'll knock the New York Times off its perch" to barely surviving today, the LA Times is a shadow of its former self.